What is a family center? “Family Center” refers to a different type of Department of Justice camp where whole families were interned, instead of just men. Crystal City in Texas is the best known internment camp where families were interned. McGehee is in Arkansas, and is where Rohwer concentration camp was located. February 23, 1942, Letter from Gihachi to Tsugio, translated from Japanese. It cannot be helped that our family is split up because we are being treated as people of an enemy country. February 25, 1942, Letter from Gihachi to Tsugio, translated from Japanese. I long for the day when I am paroled and you and the children, riding in the car you are driving, can come here and we are united. Goodbye. July 15, 1942, Letter from Gihachi to Tsugio, Lillian, and Angela; written in English. Anyway I am sorry for you and children that couldn’t take you to the beaches. I hope we unite and can go to beaches next years fourth of July. December 22, 1943, Letter from Gihachi to Tsugio, translated from Japanese. Christmas is just a few days away, but this is the third Christmas I will miss. But I think we will have to persevere just a little longer. February 16-17, 1943, Diary entry by Gihachi, translated from Japanese. My family comes from the Japanese camp in Rohwer, Arkansas, to visit. At around 10am, I see my family [for the first time] in a year and 2 months. I was surprised at how big Yetsuko was. In the year and 2 months [I hadn’t seen her] she had grown to 5’4”, 100lbs, and has grown into a splendid young lady. Despite the many hardships and worries, their grades are also good. Yukiko is somewhat smaller but seems to be doing well. She is such a cute girl. Her face is developing a lovely pale complexion. This was the happiest day since my children were born. I put on my suit that had gotten all wrinkled from being shoved in my trunk since Los Angeles. There are around 50 yards to the reception area but I reached it in a moment. The first thing to enter my vision was Yukiko, then my wife, and because Yetsuko was so much bigger than I expected I didn’t recognize her at first. 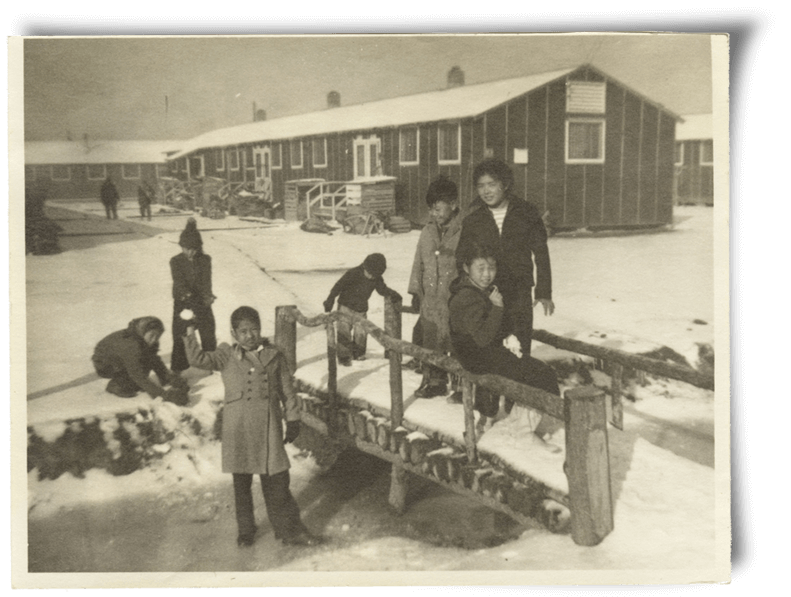 We are fortunate that my wife was able to come here to visit from a place 180 miles away, since including with the expense it was not easy; when I think of the other people in the camp I was truly fortunate. We were able to visit for two days, and parted at 3pm on the 17th. I wonder when we will be able to meet next. July 6, 1943, Letter from Gihachi to Lillian and Angela, written in English. I am writing this letter in the Sunday night of 4th July and tomorrow is national holiday that it recall the 4th July we were in Los Angeles. With the Ford we used take the umbrella blankets, soda pop, and beers for me. We had a good time in winnie baking and swimming in the Brighton beach weren’t we? Now the things like that just have passed like dream. But tonight I am writing this letter with big pleasure that we will join soon. So we have to take care of selves for the health. October 28, 1943, Letter from Gihachi to Lillian and Angela, written in English. We don’t here hear anything of the rehearing which I am waiting everyday. Lots people are paroled and left this place now. And there is rumor that within every shot times big bunch people will move to certain place. I guess it means of the family centers. January 27, 1944, Letter from Gihachi to Tsugio, translated from Japanese. As I informed you by telegram, I received my parole notice today. Please be happy. I am greatly indebted to you. My departure from here has not been determined yet, but based on other people’s experiences, I should leave in less than a month. I am very happy to think that I will be able to return home in less than a month. February 2, 1944, Letter from Gihachi to Lillian and Angela, written in English. I enjoying to imagine the sceine of meet you and family at the McGehee Depot, and it may surprise me to see you grown big nice young ladys ladies. 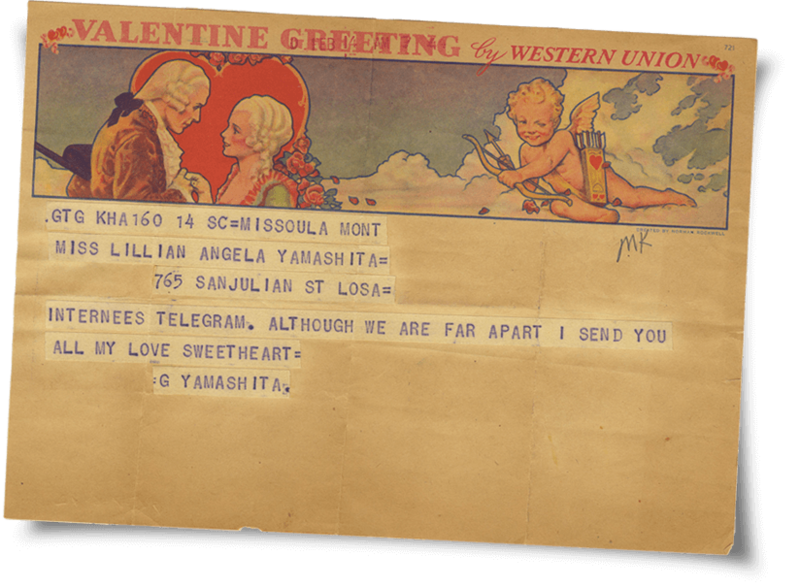 Valentine’s Day telegram Gihachi sent to Lillian and Angela while he was interned at Missoula, Montana, and they were still in Los Angeles. Children playing in Rohwer concentration camp in Arkansas. Angela is standing in the from with a snowball in her hand. 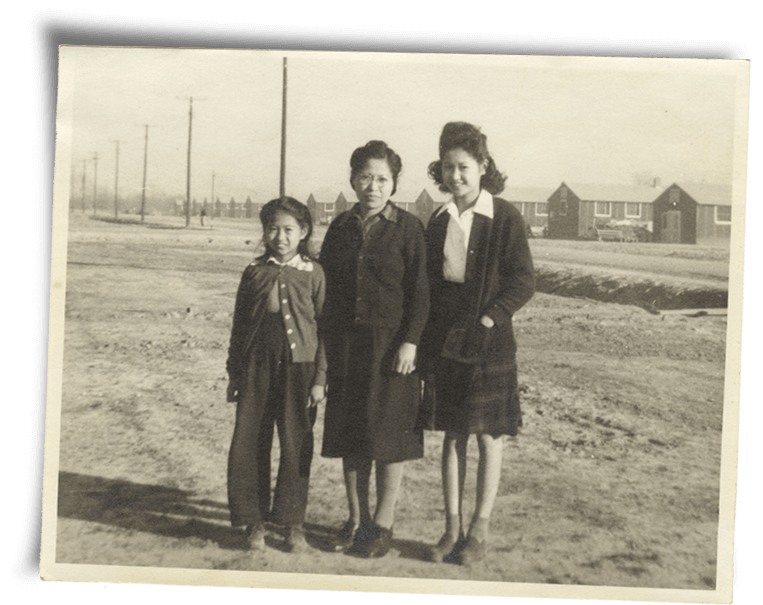 Photo of Angela, Tsugio, and Lillian in Rohwer concentration camp in Arkansas. Lillian and Angela in Rohwer concentration camp in Arkansas, ca. 1944. 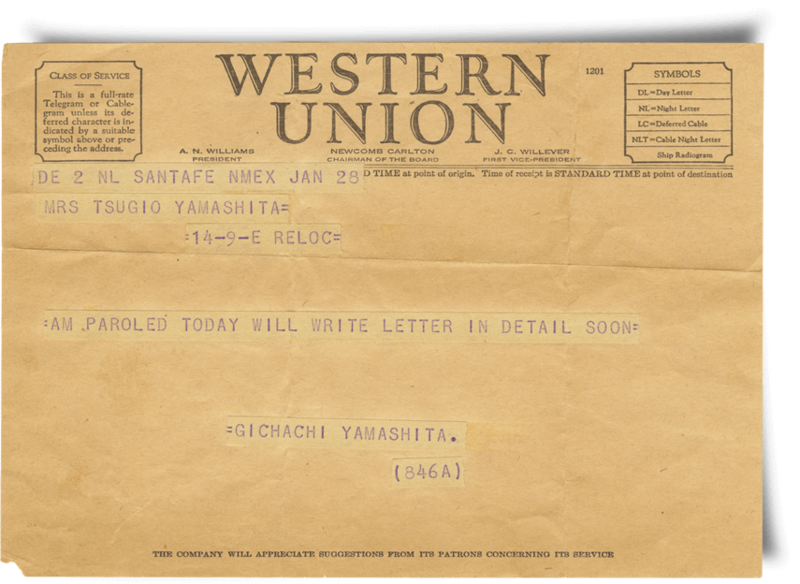 Telegram Gihachi sent to Tsugio informing her of his release date from Santa Fe. Japanese American National Museum (94.166.49). Photo of Gihachi Yamashita, detail. 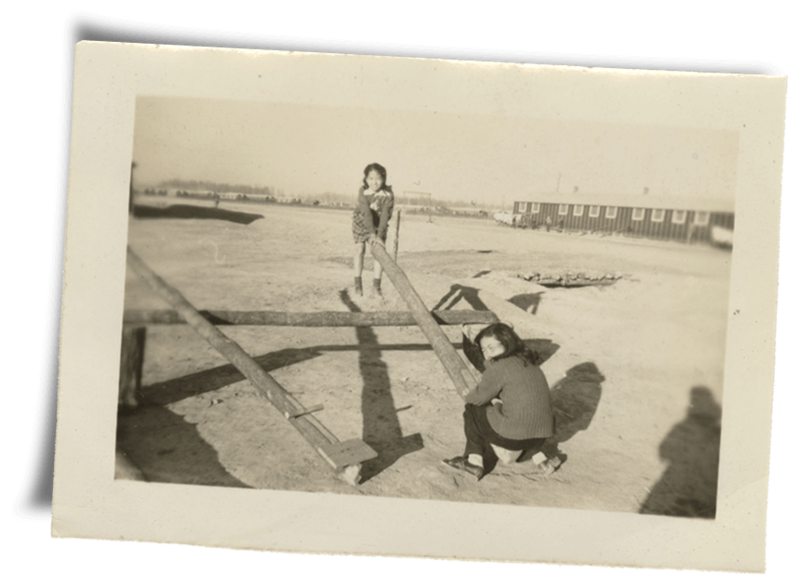 Photo of Angela, Tsugio, and Lillian in Rohwer concentration camp in Arkansas, detail. Japanese American National Museum (94.166.68).